Rainbow Acres Landscaping has been creating beautiful, functional, and sustainable landscapes for North Carolina property owners. As a licensed and experienced landscape contractor, we can easily realize the dream landscapes of our clients. From simple residential lawns and gardens to large commercial landscapes, we can guarantee their excellent designs and topnotch installation. 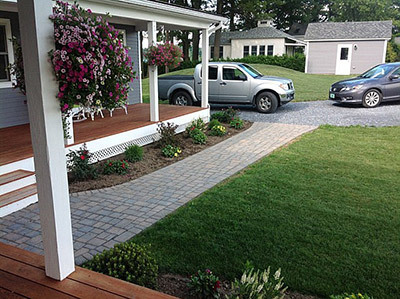 If you're from Addison, Bristol, Vergennes, Middlebury, Burlington, Brandon, South Burlington, Jericho, Essex Junction, Montpelier, and surrounding areas of VT, there is no other landscaping company to call but us at Rainbow Acres Landscaping Call us now. Lengthy experience. You’ll never regret hiring a landscape contractor with 15 years of experience in the landscaping industry. You’re guaranteed that the company has the capabilities to work on any kind of landscaping task that you may require. From site development to the installation phase, they will handle them efficiently. With experience comes an in-depth knowledge of various landscaping methods and techniques. Accredited business. All property owners should be concerned about the credibility of their landscape contractor. You want to hire a landscape company that can fulfill everything that they initially promise to you. But with us, clients like you are assured of outstanding services. We have earned our sterling reputation through years of providing professional and excellent services to residential and commercial clients in the State. Well-Trained Crews. Landscape companies will not survive the stiff competition if they can’t provide topnotch services for their Vermont clients. And the best way to do this is to have seasoned crews who are well trained and highly professional. We are a company that makes sure the people we hire are versatile landscapers with decades of experience in landscape work. This means that they can tackle all kinds of landscaping tasks that may be assigned to them. Moreover, we have specialists who can work on technical and specialized jobs, such as irrigation installation, softscape installation, landscape lighting, and hardscaping. Versatile. An important part of being a successful landscape contractor is being able to provide your clients with a wide range of services so that they don’t have to get several companies to complete the one project. For example we offer our clients a very versatile range of services that covers concrete work, stone work, hardscapes and landscaping services. You should make sure that the landscape company you are hiring can do every part of your project from start to finish! Choosing us as your landscape contractor would also mean getting professional services at affordable costs. We offer competitive pricing for all our landscaping services to serve all types of clients, particularly those with limited budget. Realizing your dream landscape is now possible if you have expert landscapers like us. Give us a call today for a free consultation on your next landscaping project!